1. Open new canvas, 800 x 800 delete background and open as new layer the template. Delete copyright layer. 2. Open as new layer papers 6, 3 and 4 then right click on each layer in layers box and ADD ALPHA CHANNEL. Scale paper 4 to 500 x 500 and paper 3 to 650 x 650. 3. Open as new layer the mask and scale to 650 x 650. COLOR>INVERT then LAYER>TRANSPARENCY>COLOR TO ALPHA then use the rectangle select tool and cut halfway thru the mask, SELECT>INVERT and EDIT>CLEAR. Duplicate and flip. Merge mask layers. Then right click in layers box and choose ALPHA TO SELECTION. Click on the paper 3 layer in layers box then SELECT>INVERT and EDIT>CLEAR. Now paper 3 is your mask so delete original mask layer and move the paper layer to bottom of layers box. Repeat these steps with paper 6 and the "toadies" layer of template, however this mask layer will be above the previous in layers box. 4. For the "skulls circle" layer in template, you will want to zoom in and use the select by color tool and try to get the purple, all of it. Then click on the paper 4 and SELECT>INVERT and EDIT>CLEAR. Add drop shadow to the original template layer by FILTERS>LIGHT AND SHADOW>DROP SHADOW with levels at 2/2/2. 6. Add tube of choice. For the "circle" layer of template use the select by color tube within the black. Then click on tube layer in layers box to make active, go to SELECT>INVERT and EDIT>CLEAR. Move opacity layer to 67. For the full body add a drop shadow to it. 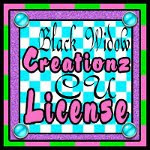 Add the copyright symbol, artist's name and website as well as your license number if applicable. 7. I used a font called playtime and right click ALPHA TO SELECTION then to SELECT>GROW by 3, add new layer fill selection with black, grow by 2, add new layer and fill with purple. Add noise by FILTER>NOISE>RGB NOISE levels at 20/20/20/0 then deselect and add a drop shadow.